Push to Kindle is quickly becoming one of my favorite Firefox browser add-on apps and it allows me to send web articles to my Kindle Fire device so I can read them later plus make any highlights and notes to the document. 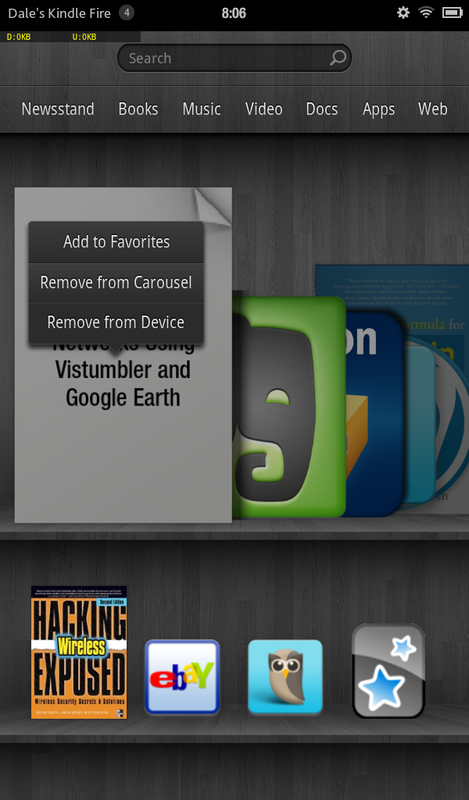 Here are the steps to install and use the Push to Kindle add-on with the Firefox browser. 1. Visit the fivefilters.org website. 2. Scroll down the page to the Browser Extensions section. 3. Click on the proper link for your browser to load the Push to Kindle add-on. 4. For this demo I’m using the Firefox browser and after clicking on the Firefox extension link it will take me to the Firefox Push to Kindle add-on page. Click on the green + Add to Firefox button to install the add-on. 5. After installing the Push to Kindle add-on an icon (looks like a pair of hands holding a book open) appears in the upper left corner of the Firefox browser. 6. Now browse to any webpage or blog post to capture. 7. Click on the Push to Kindle icon. 8. 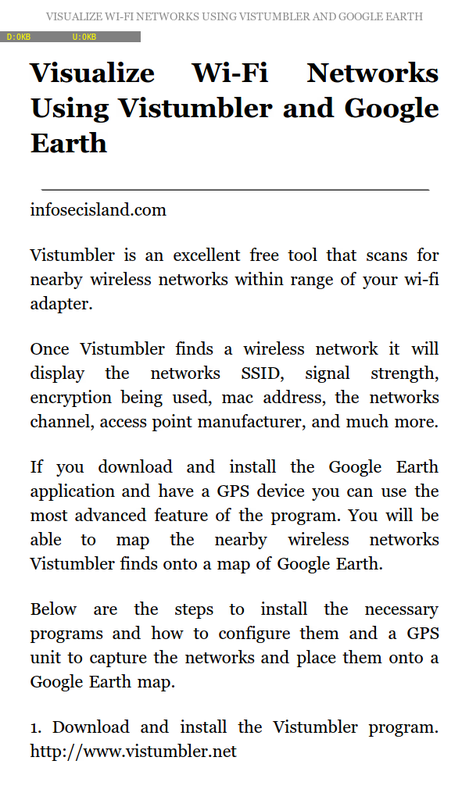 The screen will refresh to show a preview of the webpage that will be sent to your Kindle Fire. On this screen there are two email addresses that need to be filled in. One is the Send to address and the other is the Send from address (the addresses are blocked out for this blog post). 9. 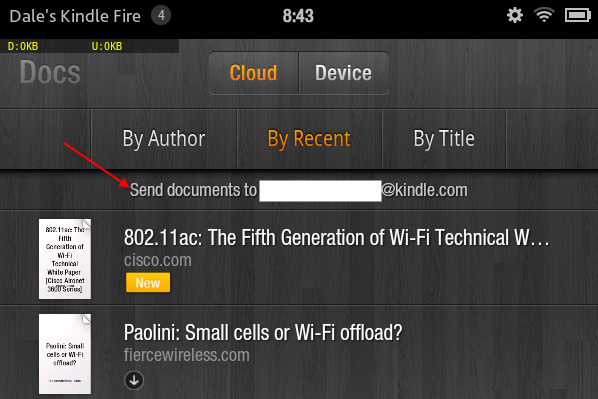 The Sent to address can be found on your Kindle Fire by clicking on the Docs link from the home page. Look for the Send documents to email address near the top of the screen (address is blocked out for this post). The Send from email address is the email address associated with your Amazon account, or could be added to your Amazon approved email address list. 10. With the email address fields filled in hit the blue Send button (refer to the screen shot in step 8). 11. After hitting the Send button the screen will update and let you know the document has been sent to your Kindle email address. 12. It may take several minutes, but an email will be delivered to the email address you inserted into the Send from address field letting you know the document was uploaded and is ready. 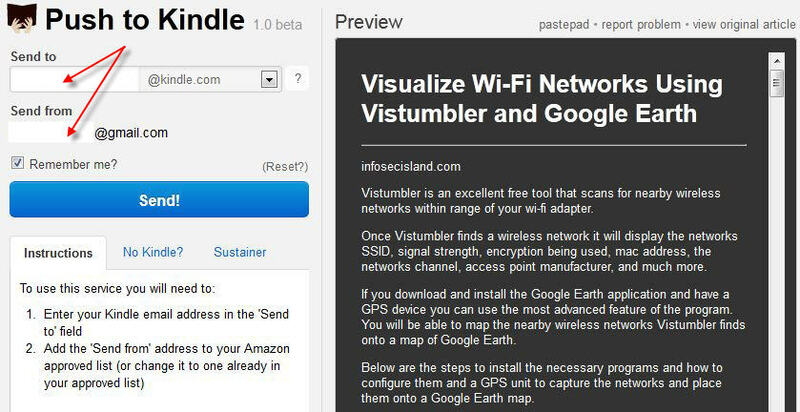 Your Kindle Fire device needs to be connected to a wi-fi network for the document to download and show in the Carousel on the home screen. 13. Tap on the document to open it. 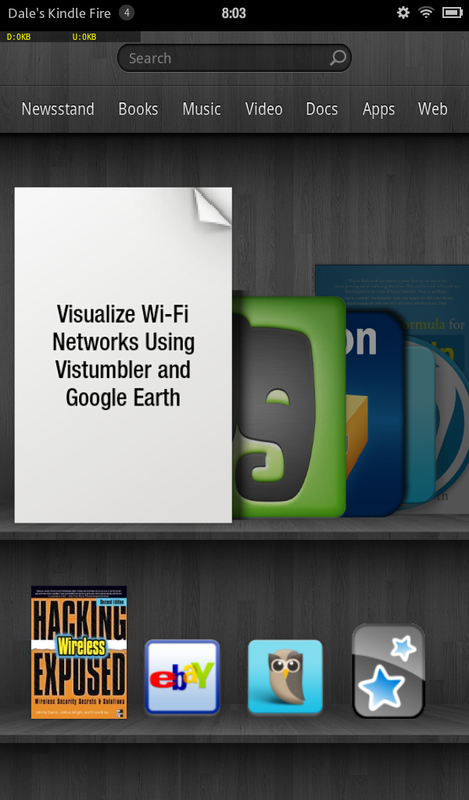 You can read through the document and make highlights, notes, and bookmarks like any other book or document on the device. 14. To remove the document from the Carousel or from the device tap on the document and hold until the pop up menu shows up with the options to Remove from Carousel or Remove from Device. 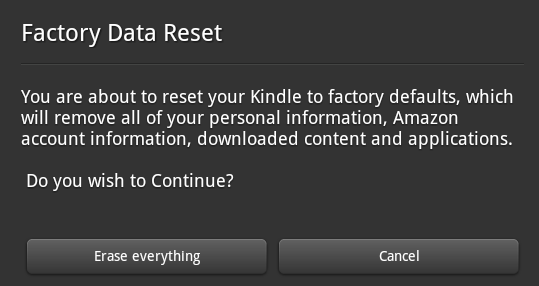 I have had my first generation Kindle Fire for 8 plus months and I still love this 7 inch tablet, but I’m very tempted to upgrade to the 7 inch Kindle Fire HD model and that is probably what is behind this tip of how to reset the Kindle Fire device back to the factory default settings. Resetting the device will erase all your personal information and any apps, books, music, etc… you have loaded on the device making it safe to resell the device or give it to someone. 1. First let’s make sure the Kindle Fire device is properly charged. 2. Tap on the Settings cog icon near the upper right corner. 3. Tap on the More icon. 4. On the Settings screen tap on Device. 5. On the Device screen look for the Battery section (it’s the third box down). If the device is not at least 50% charged plug it in and let it charge up before continuing with the reset. 6. If the device is properly charged scroll down the Device screen to the last section and tap on Reset to Factory Defaults. 7. A pop up screen will explain the reset and give you one last chance to Cancel the action, but if you’re good to go to reset the device tap on Erase everything. 8. When the reset is complete the device will reboot and there will be no evidence of your passwords, personal information, downloaded apps, or browsing history. Drop me a comment on your favorite tip as I’m always looking to learn new ways to use the Kindle Fire device. For more Kindle Fire Tips visit my first post on Kindle Fire Tips and Tricks, and you can also visit my post for some Kindle Fire Security Tips.